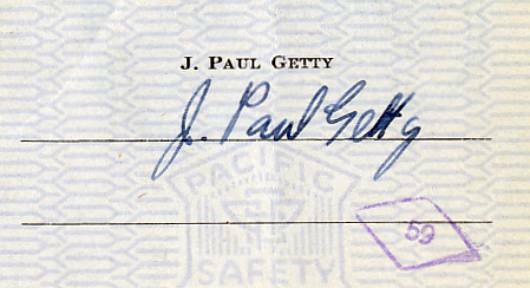 Getty, J. Paul b. Dec. 15, 1892, Minneapolis, Minn., U.S. d. June 6, 1976, Sutton Place, Surrey, Eng. in full JEAN PAUL GETTY American oil billionaire reputed to be the richest man in the world at the time of his death. He owned a controlling interest in the Getty Oil Company and in nearly 200 other concerns. After graduating from the University of Oxford in 1913, Getty bought and sold oil leases near Tulsa, Okla., with the help of his father, George F. Getty, himself an oil millionaire. Young Getty proved to be a gifted entrepreneur and by 1916 had made his first million, at which point he moved his base of operations to California. During the 1920s, having accumulated a substantial fortune, he set about gaining control of several large independent oil companies and began building an immense financial empire, a task that was to occupy the remainder of his life. His most lucrative venture was a 60-year oil concession that he obtained in Saudi Arabia in 1949, the profits from which vaulted him into the billionaire class during the mid-1950s. A man of eccentric personal habits, Getty was married and divorced five times. After World War II he spent little time in the United States and eventually settled down at Sutton Place, a large estate near Surrey, Eng. In 1953 he founded the J. Paul Getty Museum, sited on an estate in Malibu, west of Los Angeles, where he displayed many of the art objects that he had accumulated during his life. The museum moved to larger quarters in Malibu in 1974, and Getty, who died in 1976, bequeathed the bulk of his fortune to the museum's trustees to spend "for the diffusion of artistic and general knowledge." The Getty Trust became a major philanthropic foundation and built the Getty Center, a cultural complex in Los Angeles that opened in 1997.